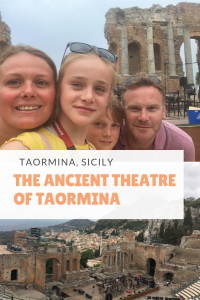 We recently spent six days in the beautiful Sicilian town of Taormina. 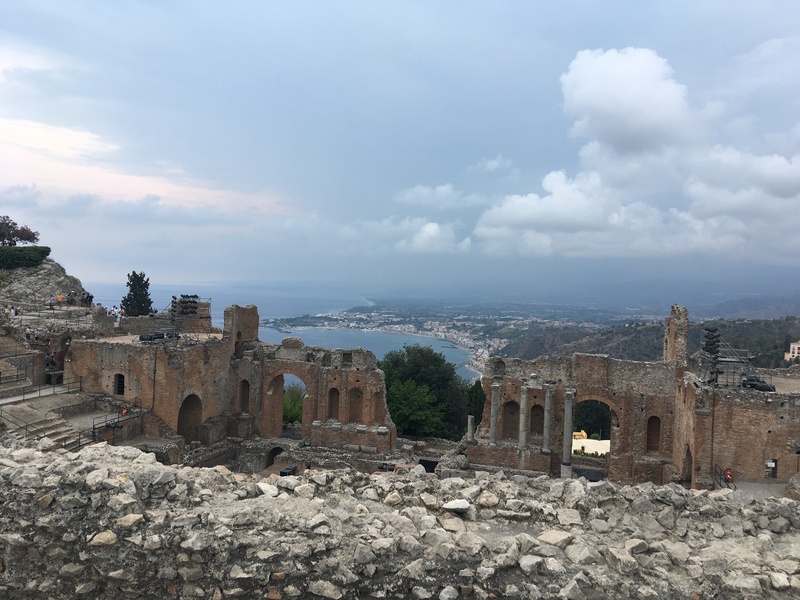 Taormina is not only stunning, it is filled to the brim with history. 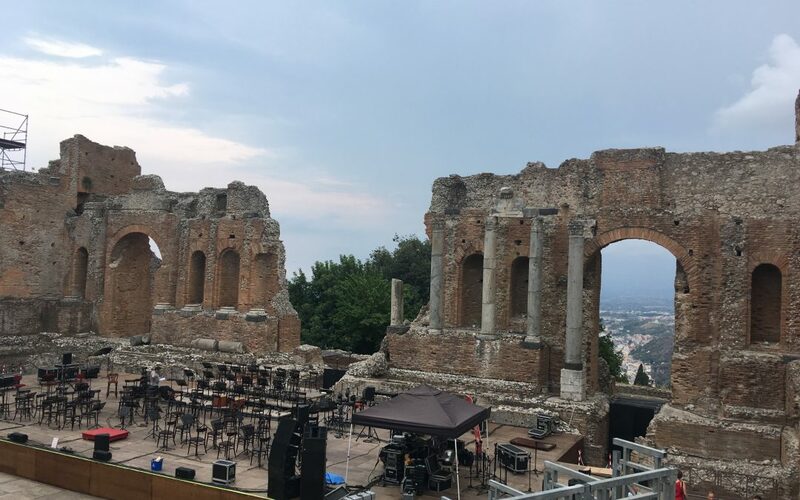 One such place, it the rather spectacular Antico Teatro (translation: Ancient Theatre). Sight-seeing with the kids can sometimes be a bit hit and miss. 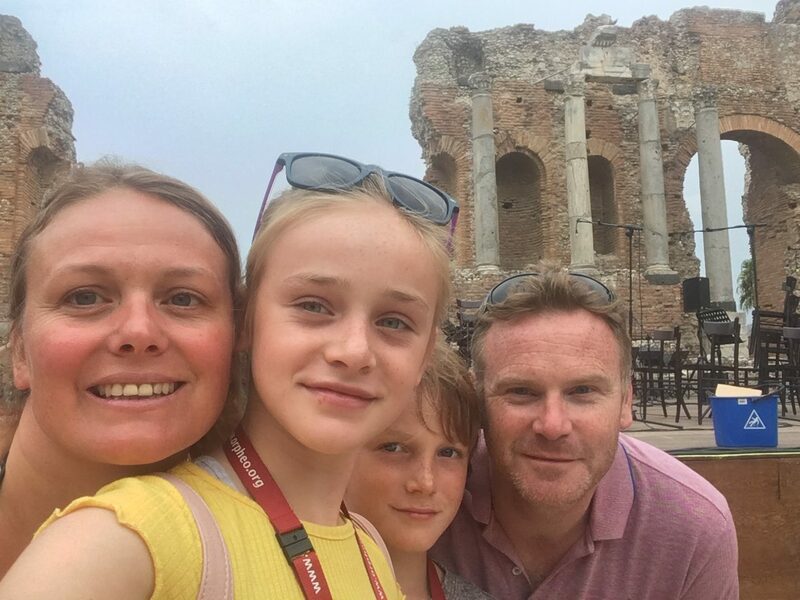 We still don’t talk about the ruins in the searing heat we attempted a few years ago … so taking them to any archaeological site is always received with a little apprehension from them. However, I needn’t have been worried: The second we stepped into the theatre, our minds were all blown. Firstly, it is located in the most idyllic situation: Looking over the Ionian Sea and the Calabrian coast, with Mount Etna sitting in the background. The Ancient Theatre first began life, sometime in the 3rd century, BC, making it over 2020 years old. As you can imagine, for something of that age, it’s not pristine, but with careful conservation and some pretty solid construction to begin with, it’s still looking mighty fine. Of course, anything of this age has been under change, reform, restoration and adaptation. However, there is enough of the old so you can really imagine it what it was like 2000 years ago. 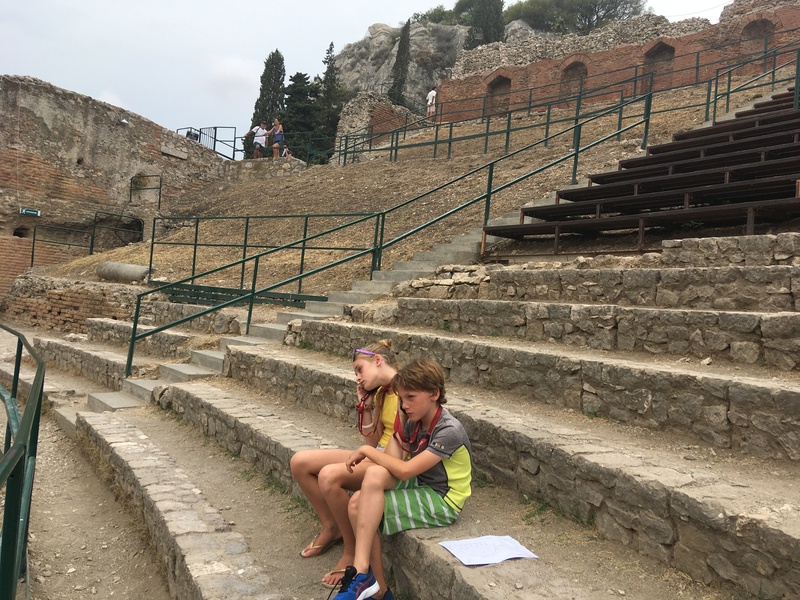 In Greek times, the theatre was built for performances, with uptown 10,000 watching. 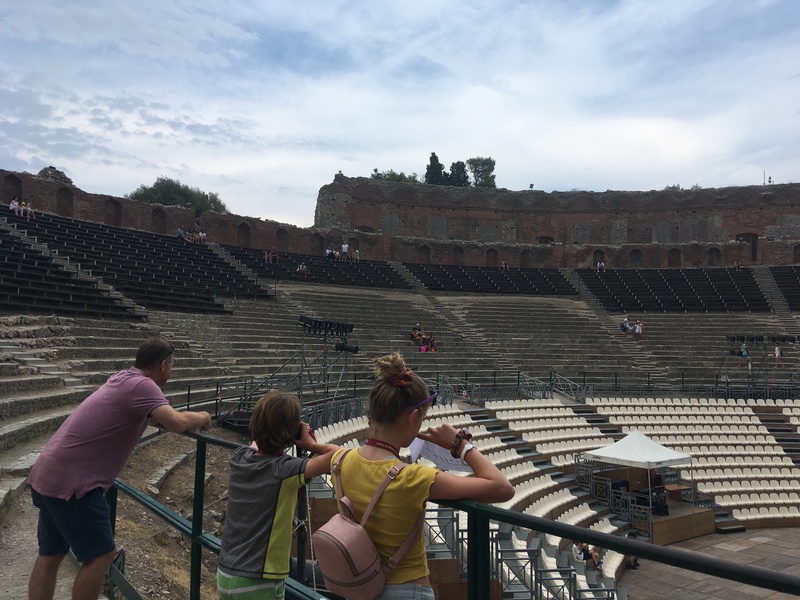 When The Romans came along, and they decided to a little renovation, and it became a place to watch the gladiatorial battles. These days, the theatre is used for pop concerts (Sting played while we were there, and Noel Gallagher played there in June! 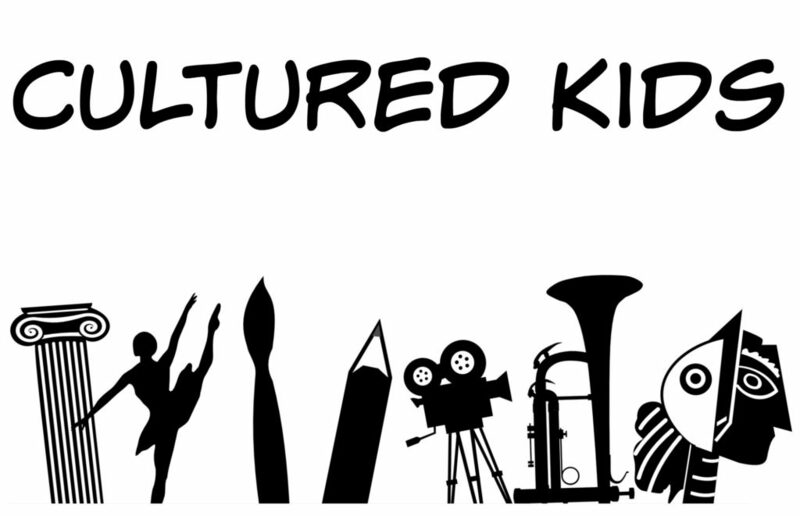 ), operas, ballets and film festivals. My children used the audio guides whilst we were there, and these were great for holding their attention at the site (having stunning it is, it’s amazing how quickly they become bored!) but also guiding them through the site, and them getting the most from it. They learnt its origins, how many it held, what it was used for and pointing out some of the archaeological fragments so that restoration could be as authentic as possible. As you exit the ancient theatre, there is an audio visual display showing how historians imagine the theatre would have looked in both Roman and Greek times. This bit was a little more hi tech for our millennial children, and also great for us all to contextualise it. Entrance is 10 euros per adult, and children are free. The audio guides were five euros each. 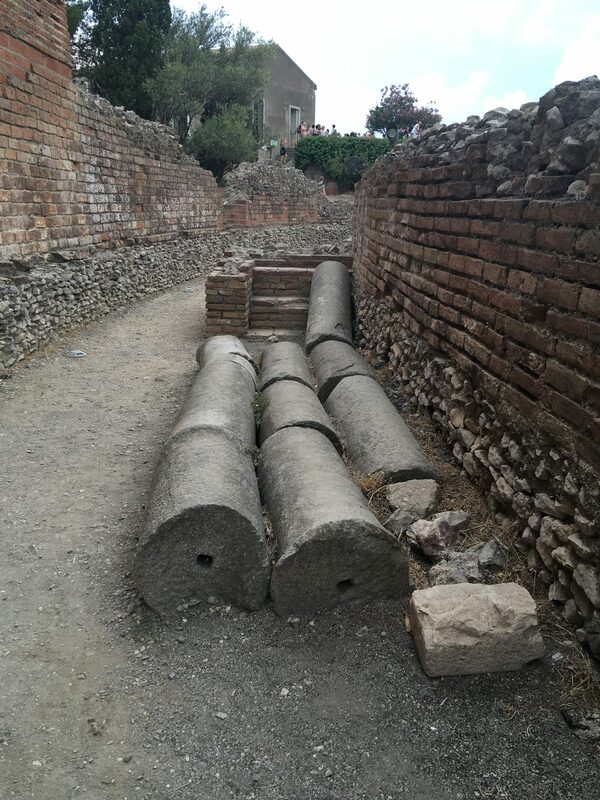 It is really easy to reach by foot from Taormina town centre, there are plenty of signposts – you can’t miss it! This is a truly remarkable archeaolgical site. Even the children were astounded it by it: It was interesting, beautiful and it had a special atmosphere that made you feel privileged to be there. It is definitely an archaeological site that has evolved as the centuries have turned, and you can palpably see how its use has changed. 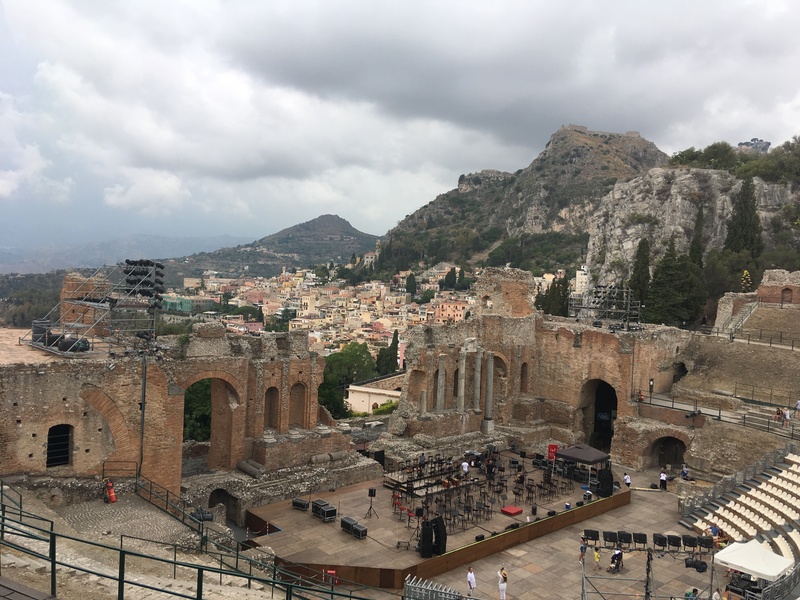 The Ancient Theatre of Taormina should definitely be on your to-do list, should you find yourself in Taormina.